The alarm sounded today before the sun had even thought about arriving. The route was to be long -- even by the mileage on the map!! Another breakfast in the room day!! The first part turned out to be the most difficult. 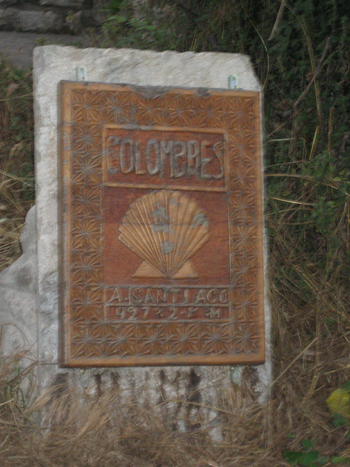 Even though the main street of Unquera was the Camino, it was not clearly marked, so confusion occurred immediately. A French couple a few yards ahead of us seemed equally confused so we joined forces and searched the town streets until we discovered the signs and took off with gusto into the countryside. A side note here: One of the things that surprises all of us is the degree of "urbanization" that is going on throughout this northern area. The developers of Spain are creating small towns out in the middle of farm land high in the mountains far from any village or city. We are not sure if these rows and rows of condos are summer vacation homes or permanent residences. When we are by the sea, we assume that the developments are definitely vacation places, but in the hills? Maybe golf hideaways! We did walk through a golf course today -- complete with golfers -- making it interesting as we crossed over the fairways using the service road as our main access to the Camino!! No one seemed upset with our trekking through -- almost like they expected us to be there. Just another hazard on the course! Like the last few days the route comprised of small villages and hamlets. The route wound around through each on country lanes that were only wide enough for a very small car. None of the lanes, of course, are one way, so the chance of being there with cars coming in both direction is high. Fortunately there were not many!! But once again the eucalyptus trees surrounded us and the cows and sheep ate. At one point we were encircled by huge old villas from long ago. Some have been restored and are residences. Letting the imagination run -- one can see the early Spaniards in full dress strolling through their gardens sipping their coffee con leche. Very beautiful sight. The weather today added to the walk in a slightly negative way. Drizzle or mist seemed to be the norm, so the Order of Blue Tarps were the required dress. When the wind was blowing, the tarps added protection, but when the breeze stopped the tarp became a sauna. The idea of shedding the tarp at any one time was not an option. Either the rain was present or the trucks passing let a wave of water fly your direction. Not a pretty sight. At one stop for lunch, the guest already there just laughed as we entered. Blue drowning rats with humps (backpacks) on their back make for a strange sight.